One of my customers asked me why can’t she edit multiple Tasks (bulk edit) in Advanced Find results grid, while it is certainly possible in any other Tasks grid. I was not aware of the this limitation and tested it myself. 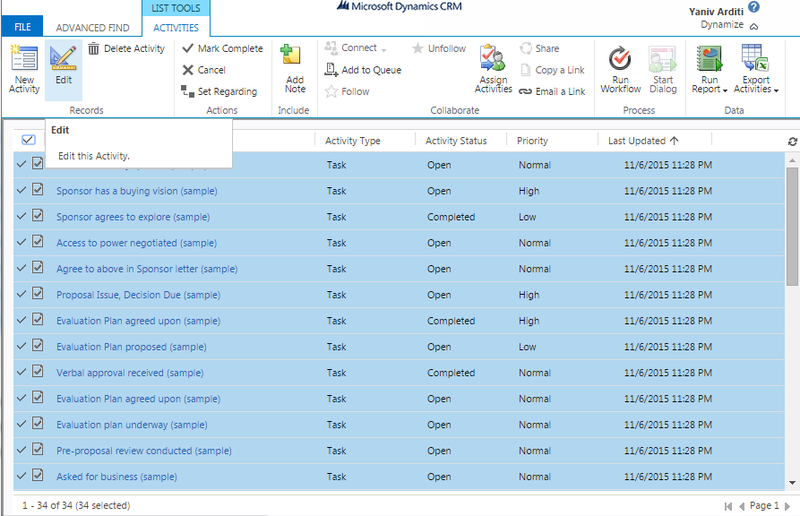 It seems that the Edit command is disabled for all Activity types in Advanced Find results grid when trying bulk edit. Instead of searching for Tasks (or any other type of Activity), select Activities as the Advanced Find query entity and add a condition on the Activity Type column to match the required type. For some reason, bulk edit is enabled for this query results. The downside of this workaround is that this query is limited to the general Activity attributes. If you need to query a custom Task attribute, you can save the query as a personal view, access it in any Tasks grid and bulk edit away.